One week ago, whistleblower Professor Stephen Hawking bravely stepped forward and warned that scientists are torturing a particle of God. For reasons unknown, the scientists discovered a way to capture a particle of God in what is known as the CERN Large Hadron Collidor that is secretly located somewhere in Switzerland. Instead of worshiping the particle as something sacred and letting it go free, the scientists are trying to rip it apart and figure out how to harness all of its energies. Professor Hawking warned the particle is growing more agitated and tormented as researchers keep using higher energies to make it burst apart, causing disruptions in space-time here on Earth. In recent years we have seen the great sinkholes form and swallow up portions of cities whole. Parts of the world that would normally not have earthquakes are having them. The Sun is shooting unusual flares. We have had three super moons already this year. This is all because the God Particle is growing more angry and is ready to unleash its wrath, which will completely destroy the entire universe if it does. At this point defensive scientists and atheists will try to argue and bury the truth under their lies. 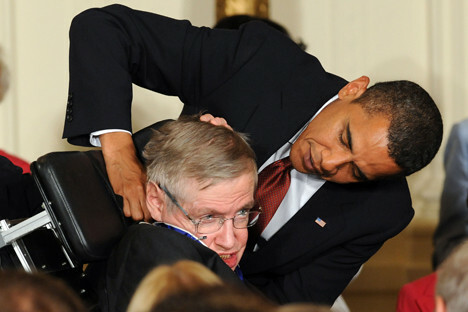 Obama already threatened to strangle Hawking for coming forward with all this vital information. If you need more proof that all of this is true, then watch the following video. The scientists at CERN literally confess, right at 16:48, that the Large Hadron Collider is a giant torture device for the God Particle. Now with that proof at hand, there is no doubt. You quite literally hear them call this monstrosity a torture device and they are using it to torment the God Particle into telling them the secret equations of life. This is no different than waterboarding a terrorist for information, but in this case, they are tormenting a holy particle of our Creator. God is literally facepalming right now.